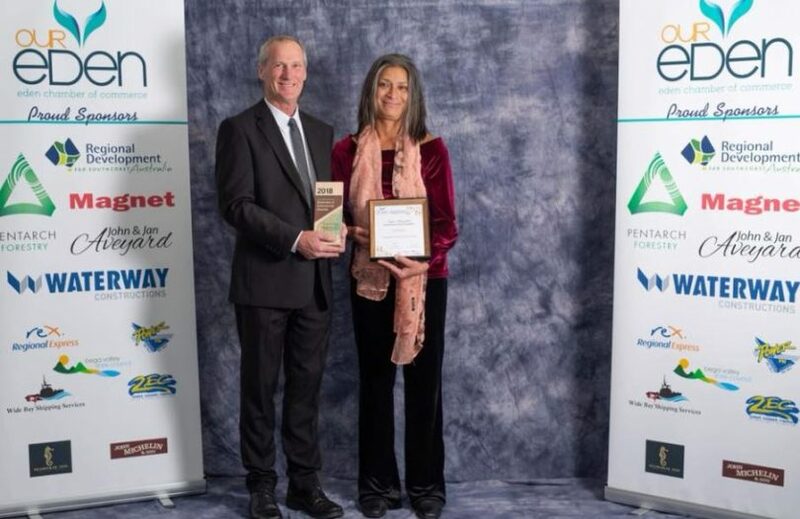 Jess Mitchell from Pentarch Forestry, with Sepa Kengike, winner of the Customer Service Award. Photo: Peter Whiter & Toni Ward. 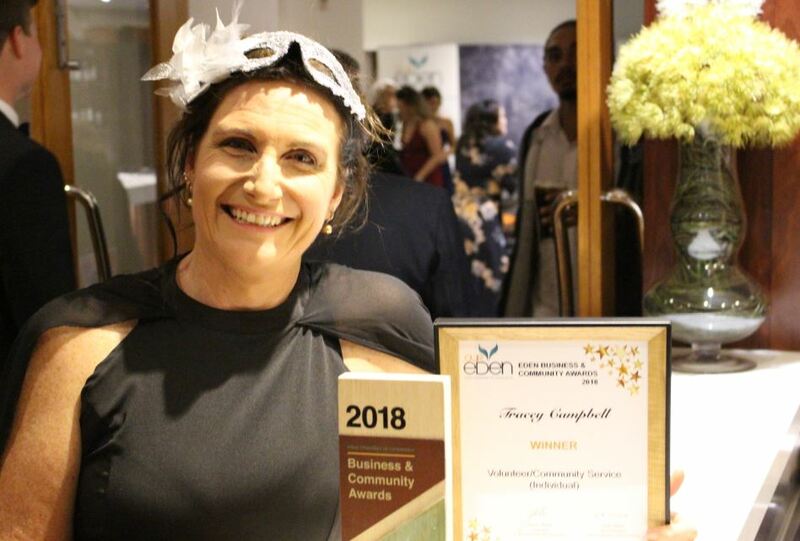 A big crowd gathered on the western shores of Twofold Bay on Saturday night for the biennial Eden Business and Community Awards hosted by the Eden Chamber of Commerce. The sell out crowd of almost 200 stepped out in their finest threads with a touch of masquerade at the historic Seahorse Inn. The pearls and cufflinks in the audience added to the sense of occasion; a celebration of the Eden community and the people, organisations, and businesses that make it work and give it character. With one hundred and seventy-one nominees, the room was buzzing. An independent panel of judges was pulled together to make the call on seven categories. A mix of local and out of town people, all with business expertise across a variety of sectors. Starting with the nominator’s testimonial, judging was based on a number of criteria tailored to each category. Mystery shoppers were deployed, plus there were interviews with supervisors, managers, and various other people. Coming from a strong group of nominees, you needed to be at the top of your game to be announced a runner-up or winner on the night. Michael Britten from Regional Development Australia. Photo: Peter Whiter & Toni Ward. “Sepa is always going above and beyond to help her customers. She is known for peeling prawns for regulars who are unable to do so because of their arthritis. “This is the only business in the Bega Valley that specialises in repairing mobile phones and tablets. Its customer service is second to none guaranteeing their repair work for 6 months and maintaining a “can’t fix, won’t charge policy”. They offer a unique range of accessories some of which are unique to this business in Australia. “Mitch is an exceptional apprentice who is doing the work of a highly experienced tradesman. As a Fitter and Machinist, he keeps the workshop in order and always produces quality work. 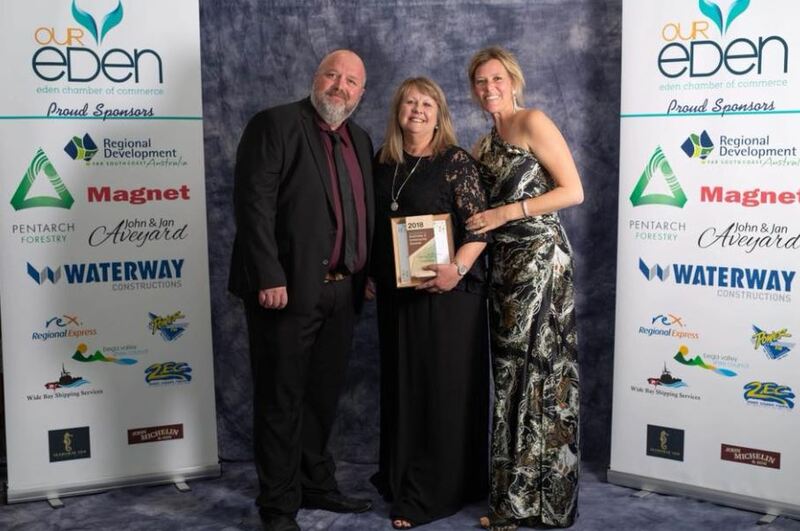 Rob Davis from Waterway Constructions, with Debbie Meers and Natalie Godward from Cruise Eden, winners of the Volunteer or Community Service Award for a Group or Organisation. Photo: Peter Whiter & Toni Ward. “Cash Mob is now 2 years old and is an initiative to support local businesses. At first, a small group gathered once a month with the aim of mobbing one business with each person spending $20 and then moving onto a cafe. So each month two local businesses benefit. “The volunteers of Cruise Eden have looked after the visitations of Cruise ship passengers to Eden since 2005. Endless volunteer hours are spent on the wharf or in the town with “Meet and Greet” or on shuttle buses as guides. “Sprout Eden aims to showcase fresh local and regional produce in their store and café. They try to cater for all tastes and dietary requirements. All fruit & vegetables for sale are grown locally. They are committed to creating a sustainable and profitable business while putting people first – customers, staff, and suppliers. This is achieved by providing excellent service within a friendly environment and encouraging honest feedback. “Acora began operations in 1967 as Reneco Engineering and has expanded to fill a growing need for the manufacture and installation of equipment for the hardwood timber industry and also the softwood industry. They install equipment in many states of Australia and also New Zealand. Their export business to New Zealand has grown by 200%. Being a family owned company the business philosophy is based on developing strong relationships with clients and staff. They analyse what the customer’s needs are and bring together the best combination of equipment to suit the task. 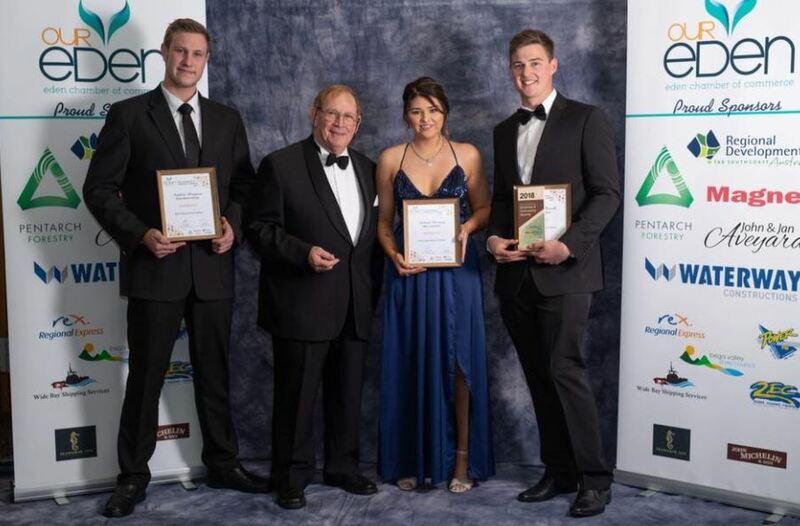 With the support of the NSW Business Chamber, winners in the ‘Excellence in Business’ categories progress on to the Far South Coast regional awards. Tracey Campbell from Eden Cash Mob, winner of the Volunteer and Community Service Award for an Individual. Photo: Ian Campbell. Tracey Campbell from Eden Cash Mob was overcome with her win. “Our next Cash Mob will be number 32,” she says. Tracey says she has the mob’s next business in mind but they don’t know it yet. “Any local business, employing locals can expect to be mobbed, if we each do a little we do a lot,” she says. 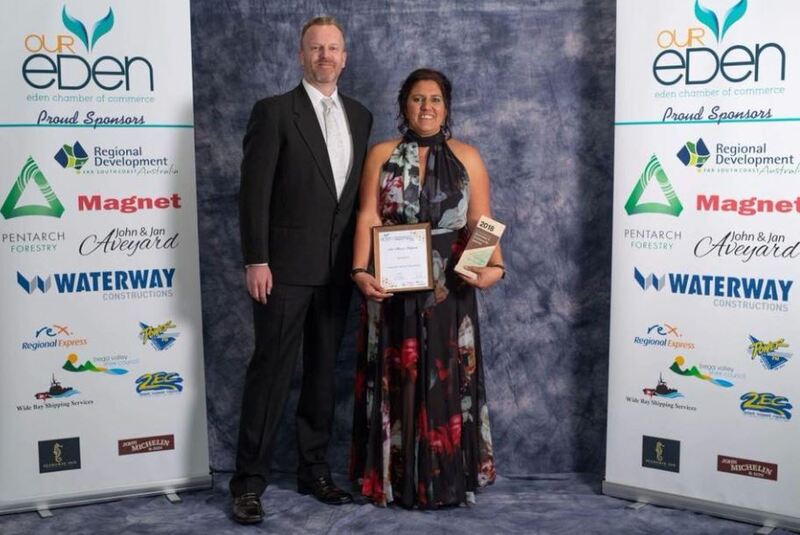 Ben Smyth from the Eden Magnet with Clair Mudaliar from E2B Phone Repair,winner of the Customer Service (Business) Award. Photo: Peter Whiter & Toni Ward. The winners weren’t the only ones making news on the night. Member for Bega, Andrew Constance announced $4 million for a cruise ship passenger welcome centre at Snug Cove. Member for Eden-Monaro, Mike Kelly was also on hand detailing his discussions trying to get components for Snowy 2.0 shipped through the Port of Eden. In an emotional reflection on her community, Chamber President, Jenny Robb thanked the nights sponsors; The Eden Magnet, Waterway Constructions, Pentarch Forestry, Regional Development Australia (Far South Coast), John and Jan Aveyard, Regional Express Airlines, Bega Valley Shire Council, Radio 2EC, Power FM, Wide Bay Shipping Services, J Michelin & Sons, and the Seahorse Inn. “So many deserving winners. What a great night,” Jenny says. More photos at the Our Eden Facebook page.